After months of diligent labor on, the part of workmen, the new $10,000 iron fence around St. Patrick's Cemetery has been completed, and stands now for the admiration of the people of Lowell as an accomplishment beautiful in itself and one that adds immensely to the appearance of the ground which it encloses. But it is more than a thing of beauty, more than, a decorative addition to a cemetery that is second to none in qualities of appearance, it is a monument to those men whose untiring efforts have made its erection possible, chief among whom is Rev. Dr. John J. McGarry DCL., director of the cemetery, and pastor of St. Patrick's church. Late in August of the Present year, work was begun on the erection of the fence through the instigation of Fr. McGarry, whose spirit had dominated the ambitious improvements that have been made in the cemetery since 1927 under the personal supervision of Superintendent John J. Meagher, assisted by Assistant Superintendent Francis Redding. The old white wooden fence that had surrounded the enclosure for so many years did not quite correspond with cemetery additions and improvements. Graves had been regraded all curbstones had been removed in order to lend a. touch of uniformity to the whole, and finally a large number monuments had been reset. 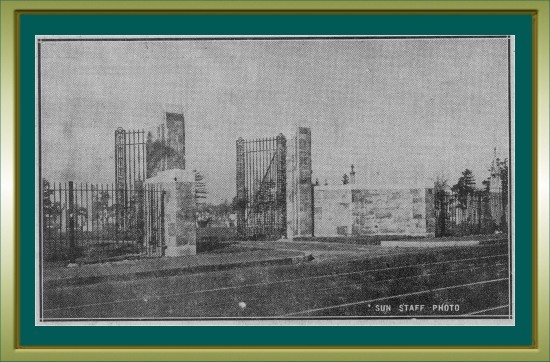 The beautification program begun by Dr. McGarry and the officials of the cemetery was continued by, the architect who designed the fence, James Flaherty, who evidenced a keen appreciation of just what was needed to lend the finishing touch to the whole scene in his first plans for the erection. The finished product of his art is the real test of that appreciation, and it is evident that it was faultless. For nothing could more suitably adorn the level, well-kept stretches of the cemetery than the 1600 feet, of dark green iron fence, trisected as it is by gateways that are in themselves a credit to the efforts of the craftsman. The pillars that flank the gateways are of Weymouth seam-faced granite in colors of brown, yellow and grey, surmounted and based by blocks of well-finished Barre granite that was furnished by the Lowell Monument Company. The pillars which are about 10 feet in height, are set back about 10 Yards from the fence proper, and are joined with the same by low walls of seam-faced granite that describe a graceful semi-circle about ground plots that are to furnish beds for flowers and plants in due time. Massive iron gates are swung from each pillar and weigh one-half ton each. The gates are double swinging and have an attractive fleur-de-lis design adorning each extremity vertically. The fence itself is composed of eight-foot sections, which are five feet in height. A three-inch I-beamed post occurs at every eight-foot interval, and each post is surmounted with an adornment. After the workmen had completed the laying of the fence material, the iron was given two coats of red lead to serve as a preservative, and then one coat of bronze green was applied with most satisfactory results.